With the closed panel timber frames being manufactured within our own factory, once approval received of the fabrication drawings, manufacture can commence immediately. We advise our Clients that upon acceptance of our quotation, 8-10 weeks allows us to design, engineer and manufacture all the frames including ordering of any structural elements and fixings for delivery to site direct. Once the frames are on site, within 2-3 weeks, depending on the final design specification, you will have a completely weatherproof structure. Closed panel construction speed allows for a quicker return on investment as well as allowing for more accurate budgeting with its precise timescales. On the right and below are some site photos of a closed panel construction. External view of closed panel timber frame new build home with the soffit & fascia installed and roof felt and battened ready for tiling. Ground floor panels of a closed panel new build. Internal walls have Fermacell Board to both faces. The service void within the panels provides convenient access for the plumber and electrician to carry out their 1st fix which will also reduce their time on site and their costs. Not only this, but the service void also provides improved thermal performance to the panels. Along with our posi metal web joist design, the trades access to both walls and floors is extremely easy and provides adequate housing for any piping and cabling. On the right is a diagram of a very popular closed panel design where you will see the service void and an additional 50mm Celotex insulation reducing cold bridging which is an optional extra with our closed panels. Which ensures that every element of the panels are quality controlled and of the highest standard. 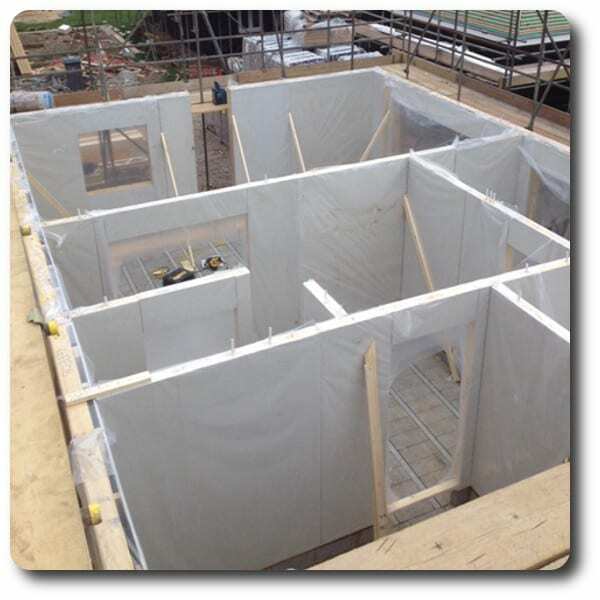 The vapour control foil, breather membrane, insulation and high performance fibre board are all installed into the timber frame within the factory before they are wrapped in protective plastic and loaded onto a lorry for delivery to site. They provide Client’s with a completely water and wind proof structure which is ready for external and internal finishes. Due to the panels being completely manufactured within a factory environment, this reduces the amount of waste on site considerably. Timber is a completely renewable resource which is completely organic and also non-toxic, so if any waste timber is on site, this can be used for burning for energy or recycled for use as another product. Fermacell Board is used on the internal face of the external panels as well as to both faces of the internal walls. Fermacell offers excellent sound, fire, impact, racking and moisture resistance. It suits well to off-site fabrication which means reduced site waste and reduced construction time. The strength of the board allows for up to 50kg load weight per cavity fixing and 30kg per screw so eliminates the requirement for noggins and means anything from kitchen cabinets to gym equipment can be fixed direct to the board. For speed of construction, you can also decorate directly onto the board, whether it be paint, wallpaper or tiling, or we suggest skimming for a better finish if painting. Using the board pre-fitted in our factory will ensure a quicker build-time, whilst also saving on additional costs, i.e. plasterers. Because the closed panels are manufactured within a controlled factory environment, this ensures that they are built to very high standards of thermal insulation and air tightness. The insulation that is fitted to the panels enables the structure to achieve lower u-values and also long term energy savings for the whole building. There is also a vapour control layer fitted for greater air tightness and once the panels are assembled on site an additional sealant is used to assist with ensuring a greater air tightness. 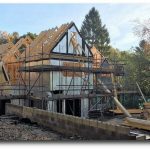 Vision Development believe that the closed panel timber frame system is a great addition to open panel timber frame which is already extremely versatile. The speed of construction eliminates weeks from your project and with the modern construction techniques will gain much lower U Values than previously achieved. All our packages can be tailored to suit your requirements and we are happy to assist in the design of the package in order to meet your requirements, budget and the ‘U’ value you wish to achieve. To learn how our closed panel timber frames can help you get an energy efficient building quickly and cost effectively call us on 0118 971 2181, email us or use our Contact Form.